We have compiled a$$-kicking resources on the topics of restructuring, tech, finance, investing, and disruption. You can find it here. We recently added four new books on our “to-read” list: (1) “When the Wolves Bite” by Scott Wapner (about the Carl Icahn/Bill Ackman Herbalife battle), (2) “I Love Capitalism! : An American Story” by Ken Langone, (3) “Factfulness” by Hans Rosling (recommended recently by Bill Gates) and (4) “Enlightenment Now” by Steven Pinker (recommended recently by Warren Buffett). We’ve also added “Bad Blood: Secrets and Lies in a Silicon Valley Startup” by John Carreyrou. He tells the story of Theranos’ Elizabeth Holmes’ epic deception. We are definitely adding this to our list of beach reads. It was clear from our survey results that people are hungry for a$$-kicking resources on the topics of restructuring, tech, finance, and disruption. We went ahead and started compiling a "reading list," of sorts for your benefit. You can find it here. This will be a growing list: if there are any resources that you think should be included, please let us know below. A number of you have already submitted recommendations and we expect this list to change weekly. Amazon. A technical but interesting piece by Benedict Evans. Artificial Intelligence. Wall Street is effed. And, generally speaking, "There's going to be huge displacement," says Mark Cuban (video). Investing. Stanley Drunkenmiller has some thoughts (video) about the markets today including, among other things, how "monetary radicalism" has created an environment for sh*tshows like Steinhoff International Holdings (owner of the ubiquitous Mattress Firm), Bitcoin, and the hunt for yield. And Jeffrey Gundlach thinks that junk bonds are going to be the victim of unintended consequences of the tax plan (video). Of course, this may increase the likelihood of default and spark more bankruptcy filings. Cov-Lite Loans. Lots of focus on this subject lately. Here, Mark Laber and John Yozzo of FTI Consulting Inc. discuss the recent trend. Healthcare/Obamacare. Does anyone understand what the eff is going on? Here, courtesy of Bryan Cave LLP's Mark Duedall, Leah Fiorenza McNeill and Jacob Johnson, is a brief summary about what this week's (strange) turn of events may mean for those in the restructuring space. Impairment. Mark Broude and Jeffrey Mispagel from Latham & Watkins LLPdiscuss the recent Ultra Petroleum Corp. decision and the resultant circuit split emanating therefrom. Media Company Disruption. This was an interesting piece by Ben Thompson - using Harvey Weinstein as context - about how traditional media companies have been disintermediated. Self-Driving Cars. The Brookings Institution released a report about investment in the new technology. Amazon. FTI Consulting's Christa Hart and Khaled Haram ask whether the retail behemoth is invincible. Canada & Oil/Gas Remediation. Michael Nowina and Glenn Gibson of Baker McKenzie write about a significant (and somewhat perplexing) decision about who bears the costs of remediation of abandoned oil and gas wells. Distressed Banks. The Federal Reserve Bank of New York Staff weighs in on how to treat them. Retail. In this ABI podcast (audio, obvi), Bradford Sandler of Pachulski Stang Ziehl & Jones LLP and Amir Agam of FTI Consulting discuss recent trends in the retail space. This dude predicted that Amazon was going to buy Whole Foods. He's funny, he's smart, and he's frikken everywhere now. If he's got something to say about 4 of the 5 highest market cap companies, it's wise to listen. You can get it here. When the "Steve Jobs of Investing" puts out a new book, you're damn straight we're gonna read it. 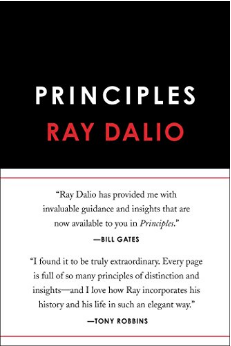 Bill Gates is quoted on the cover. Enough said. You can get it here. D&O Insurance. David Banker, Wojciech Jung and Eric Jesse of Lowenstein Sandler LLP provide an interesting summary of the implications of the recent Sixth Circuit case, Indian Harbor Insurance v. Zucker, 860 F.3d 272 (6th Cir. 2017). Now reconcile this case with the "Governance" blurb below. Retail. Joshua Sussberg, Christopher Greco and Patrick Venter of Kirkland & Ellis LLP provide a summary of retail issues and recent retail bankruptcies (firewall). Automatic Perfection. Bracewell LLP's William Wood III, Jason Cohen and Shannon Wolf summarize the Third Circuit's recent holding on the subject in the SemCrude LP case. Yes, the one from 2008. Chapter 11 Alternatives. Laura Davis Jones of Pachulski Stang Ziehl & Jones LLP provides a good summary of the various alternatives to a Chapter 11 filing. Portfolio Company Dissolution. Bayard PA's Justin Alberto and Sara Bussiere provide some options for efficiently winding down and dissolving a portfolio company in Delaware. Retail. Some interesting thoughts on what is needed for a winning retail experience outside of the physical store. Lease Stripping. Distressed commercial real estate is on everyone's radars these days with the retail bloodbath being what it is. A recent Ninth Circuit ruling allowed for lease-stripping through a Section 363 sale. Take note. A good summary fromBallard Spahr LLP is here. Recharacterization. The Supreme Court granted petition for certiorari to review the Fourth Circuit Court of Appeals' recharacterization decision in PEM. Here, a brief refresher on the issue from Squire Patton Boggs. Electric Vehicles. Choice quote: "The EV revolution is going to hit the car market even harder and faster than...predicted a year ago." The report is here. Restructuring Outlook. Houlihan Lokey's Co-President, Captain Obvious...we mean, Scott Adelson, highlights retail (video) as the hot sector for distressed activity with the potential to top energy in terms of revenue.